We’re officially in the Fall season which means that it’s time for all things pumpkin – sweet & savoury! 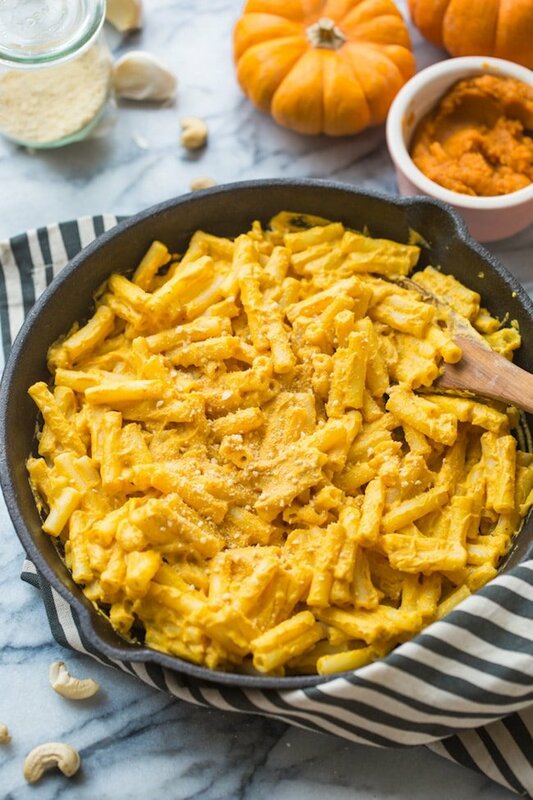 I started out with something sweet a couple of days ago with my paleo + nut free pumpkin molasses cookies so now it’s time for a more savoury dish with this super silky and downright delicious vegan pumpkin mac and cheese. All you need is about 20 minutes and 10 ingredients to make this dish. Start off by prepping your pasta – just plop the pasta in a pot of boiling, salted water and let the water do its thing. While the pasta is boiling you can move on to prep your sauce. In another skillet/pan warm up a little bit of olive oil and sauté your garlic for the sauce. You don’t need to cook it for long – just a minute or two should do the trick. Sautéing the garlic first helps to tone down its sharpness. Even if you love garlic this really does help to smooth out the flavour so that it adds to the sauce rather than detracts from the overall flavour. Once cooked, move on to making the sauce. Simply add the rest of your ingredients to a blender and process until smooth and creamy. 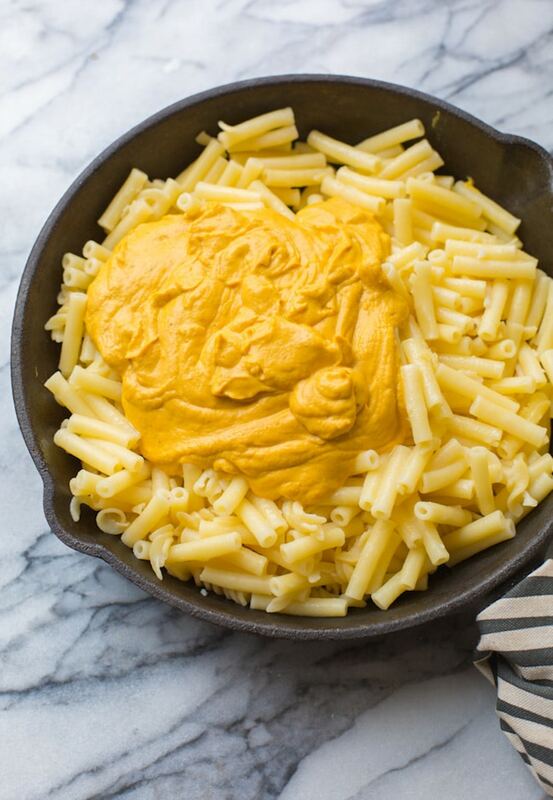 These ingredients added along with some salt, pepper, water and a touch of vinegar makes for an incredibly rich and super silky pumpkin mac and cheese sauce. At this point its just a matter of pouring over your prepared pasta and serving. This pasta makes for a really lovely, healthy fall or winter dinner. 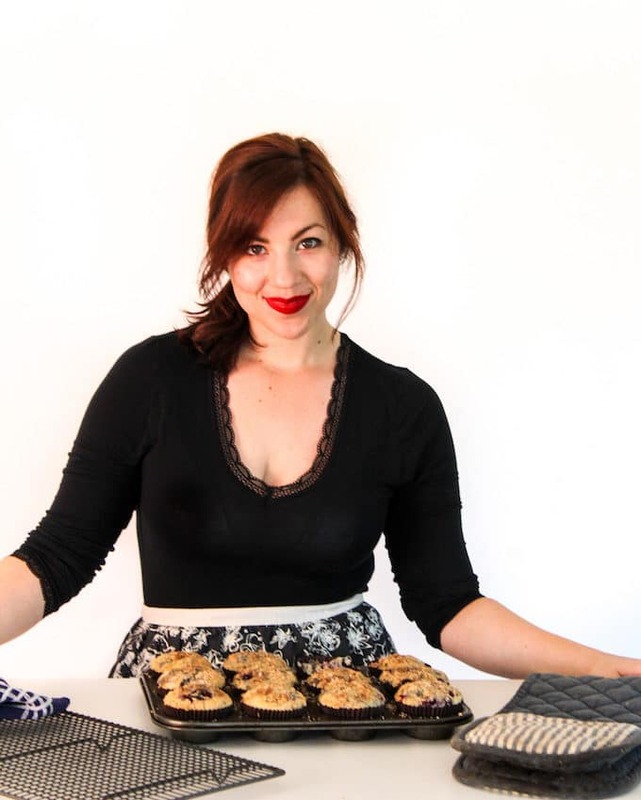 It’s naturally gluten, dairy and soy free with simple, wholesome ingredients. You can also serve it over something like Chickapea pasta (made up of only lentils + legumes) if you wanted to make this a grain free meal as well. With the holidays coming up this could also make for a fun side dish to serve and of your dairy free friends and family. Ideally yes. I like to soak the cashews overnight if I know I want to make this the next day – that way they’re ready to go right when you need them. If you’re working with a really powerful blender like a Vitamix you can probably get away without soaking the cashews, but you’ll need to blend it for a couple of minutes. If you’re really pressed for time then you can always try boiling the cashews in hot water for about 20-30 minutes. I’ve done this a few times myself and it works ok with a little extra blending and care. Can I make this without the cashews? If you can I do recommend using cashews. This recipe was designed specifically with cashews in mind so any changes in ingredients will alter the taste as well. If you have a cashew or nut allergy you can swap out the nuts for sunflower seeds. The colour might change but it will work in a similar way. You can also use macadamia nuts as well if you’d like. For both of these substitutes make sure that you also soak your nuts/seeds. Sort of. You can freeze the sauce on it’s own without the pasta for up to three months. Label and store in a freezer safe bag. When you’re ready to use it leave it out to defrost overnight. To defrost it quickly: Fill up a large bowl with hot water and submerge the frozen bag (still sealed) in water. Let the sit and defrost – it will take about an hour. You may need to change the water once or twice to keep it warm. 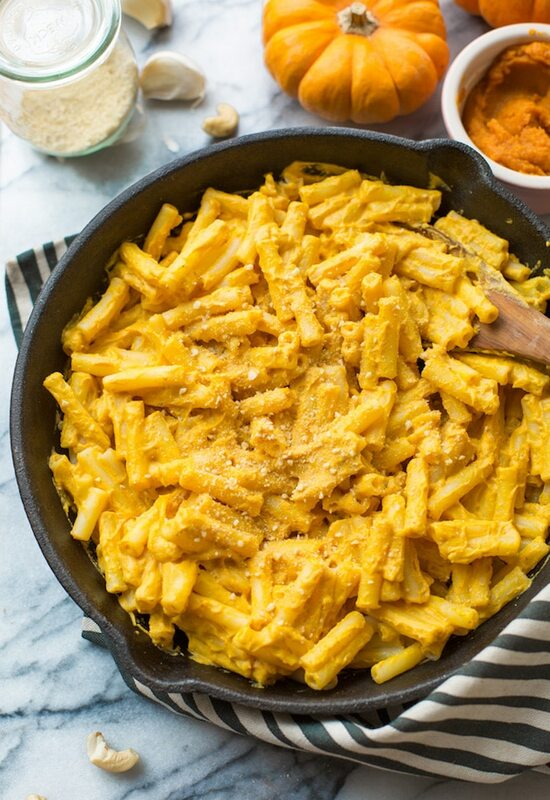 Don’t forget to #asaucykitchen on instagram if you this Vegan Pumpkin Mac and Cheese! I love seeing what you make! You can also post your pictures to my facebook page! Prep your pasta according to package instructions. Heat the olive oil in a medium sized skillet over a medium low heat. Add the garlic and cook for about 2 minutes stirring the whole time. Cook until the garlic turns slightly golden and is fragrant. 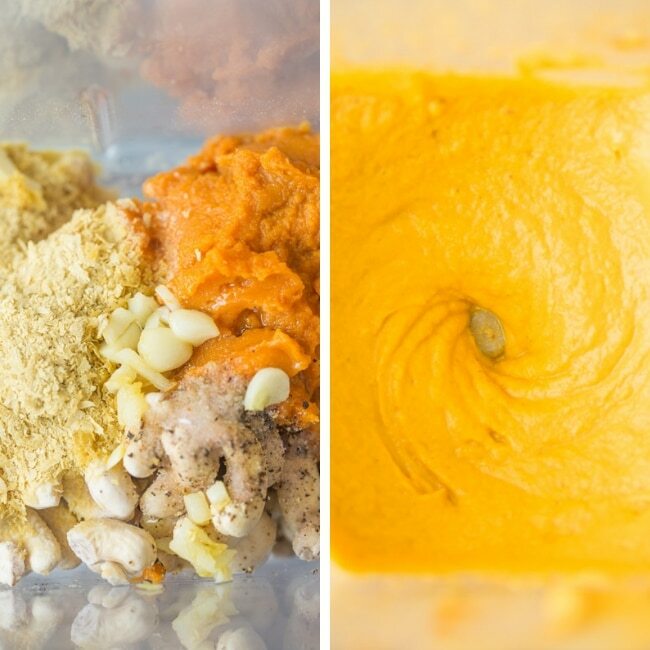 Add the cooked garlic to a blender along with the pumpkin, cashews, nutritional yeast, vinegar, water, salt and pepper. Blend on high until completely smooth. Taste and season with a little more salt and pepper as needed. You can freeze the sauce on it's own without the pasta for up to three months. Label and store in a freezer safe bag. When you're ready to use it leave it out to defrost overnight. To defrost it quickly: Fill up a large bowl with hot water and submerge the frozen bag (still sealed) in water. Let the sit and defrost - it will take about an hour. You may need to change the water once or twice to keep it warm. This recipe makes about 2 cups of sauce. 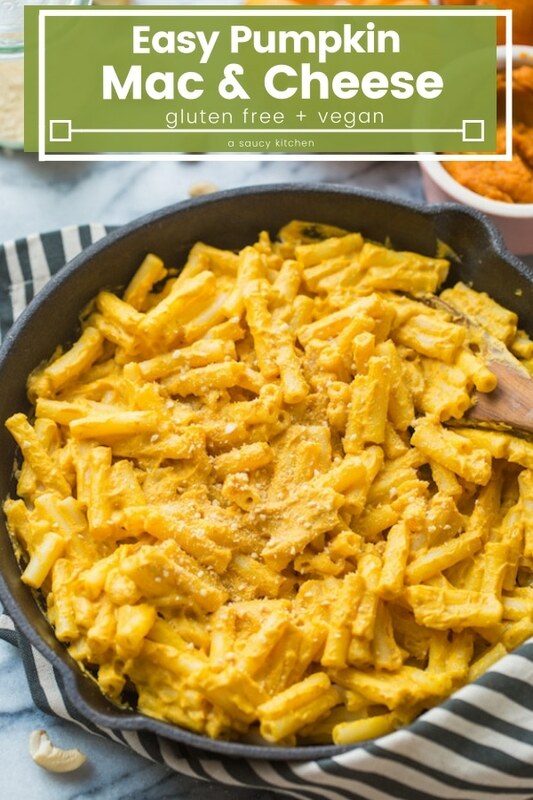 For the most accurate nutritional info this recipes is calculated for just 1/2 cup of sauce and does not include pasta since each pasta brand/type will vary in calories and general nutritional value. If you're interested in counting calories/keeping track of what you eat I recommend using something like myfitnesspal to figure out how many calories are in your pasta (or whatever you choose to serve this over) and then entering in the sauce separately. It just says cashews. Are they raw cashews? Roasted/salted? Roasted/unsalted? Hi Bryan! I wouldn’t say it’s overwhelming, but honestly that could just be me. I do think the pumpkin flavour just kind of merges with everything else. Hope you like it if you try it!